We've found doing anything outside of our home with Gwendolyn to be challenging. Her machines, the power issues, being outside of our comfort zone, having no night nurse, the change in schedule, exposure to viruses, the added stress, etc. But, we also know how much Gwendolyn enjoys getting out and about, experiencing new things, and being social, so it's important to us to push ourselves to get Gwendolyn out as much as possible within the confines of her SMA. When we decided to do this trip there were a ton of things to consider, plan for, and coordinate, but having access to an RV (thank you Aunt Kristen and Uncle Richard) that is more or less a house on wheels made our decision to travel 5,000 miles cross country over a month much easier. So, how did we make it work in the RV? Logistics and machines - We know we are very fortunate, as the RV that we borrow from my sister and brother-in-law is very spacious and has all of the bells and whistles to make life on the road as easy and stress free as possible. We have found that converting the table directly behind the driving area into Gwendolyn's permanent bed works best for us. That way, when we are driving she and Victoria are never far away from me and we have a permanent place to keep all of her machines organized and out of the way. It also allows us to easily administer Gwendolyn's breathing treatments while on-the-go. We put Gwendolyn's bi-pap, bi-pap humidifier, bi-pap battery, and suction machine on top of her bed so we have easy access to them at all times. Underneath her bed we put her Cough Assist, nebulizer, pulsox, Ambu bag, and backup gel cell sealed lead acid battery, sine wave inverter, and battery charger. We plug all of her machines into one power strip that is kept underneath her bed to keep all of the cords out of the way and organized. We hang her feeding machine on one of the cabinet handles above her and we keep two large portable oxygen canisters in the back of the RV for emergencies. Power - As parents of a child who is dependent on life-critical machines to survive, reliable electricity and plans for multiple sources of backup power are constantly at the top of our minds. The RV is basically no different from our house from a power standpoint. When we are driving and the RV is not plugged in to external power, plugs in the RV run through a massive on-board inverter from several rechargeable batteries that will last for at least a full day without doing anything to recharge them. When we are parked in an RV park or near any normal power source, we simply plug the RV into the power source and we get full power for as long as we need it. The RV also has a very powerful on-board generator that we can use to charge the batteries while we are not plugged in or if we ever have power issues while parked at an RV park. The generator runs directly off of the 100 gallon diesel tank in the RV and burns about 1 gallon of diesel per hour, so we have a lot of leeway on the generator if we ever get in trouble. The generator is also necessary to power the CoughAssist machine. In addition, as further backup we have a 12 Volt 32 Ah gel cell sealed lead acid battery that we leave constantly plugged into a 12 Volt 1.25 Amp gel cell battery charger inside the RV. 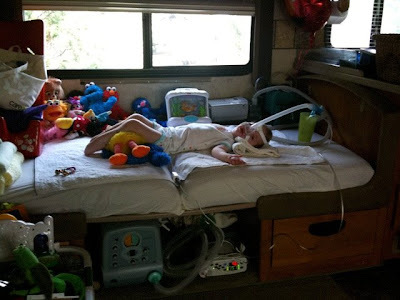 If we ever lost full power in the RV we would connect the gel cell sealed lead acid battery through our Samlex 600 Watt 12V Pure Sine Wave Inverter and could more or less run all of Gwendolyn's machines, including her Cough Assist machine, for several hours. We also always have Gwendolyn's bi-pap plugged into a BatteryGeek C-222 lithium-ion battery. This super small, lightweight battery allows us to take Gwendolyn out on her bi-pap on battery but it also serves as an immediate fail-over if we have any power issues. It will basically run Gwendolyn's bi-pap for about 5-8 hours on one charge. Sleeping - While on the road, we don't have a night nurse (sigh!). While definitely not optimal, we make it work by taking turns sleeping on the pullout couch opposite Gwendolyn's bed each night. The other gets to sleep in the back of the RV on the queen size bed. This way at least one of us is always semi-fresh each day. And, regardless of schedule, Victoria is always thoughtful and never has me take the night shift next to Gwendolyn on nights before long drives; trust me, it's much safer for everyone. Supplies/Medication/Food - Bringing enough medical supplies, medication, and food for Gwendolyn for a month was a bit of a challenge. We have to thank our home healthcare company, LifeCare Solutions, our hospice, Visiting Nurse and Hospice Care of Santa Barbara, and our pulmonologist, Dr. Nanci Yuan at Lucile Packard Children's Hospital at Stanford, for making sure we had everything we need for a month and for every "what if" scenario ahead of time. For our trip we brought 90 cans of Bright Beginnings soy pediatric drink, 120 vials of Albuterol, 8 20mL bottles of Robinul, several antibiotics and inhalation medications for emergencies, a spare set of every single machine that Gwendolyn uses (this was a huge relief for us), and medical supplies and spare medical supplies and spares for the spare medical supplies for more than a month on the road. Emergency Planning - While it was next to impossible to plan a trip like this and stay near hospitals that will be familiar with our philosophy of care for Gwendolyn, nevertheless we wanted to be prepared with a comprehensive list of Gwendolyn friendly pediatric intensive care units (PICU) along our route. Our local hospital PICU, Santa Barbara Cottage Hospital, helped us put this together and we also brought with us a list of SMA specialists and their facilities across the country to have handy just in case we needed to have Gwendolyn transferred somewhere while on the road. While we obviously hope that we'll never need to use any of these, it puts us at ease knowing that we have the information handy if it is ever needed. I'd be lying if I didn't admit that traveling for a month in an RV with a child with SMA Type I was challenging - it most definitely was. But, in hindsight, given all of the experiences and firsts and laughs and cries that we had as a family, it most definitely was all worth it. And while the extra room and bells and whistles that our RV has are nice, they are not essential. In my opinion, all you need is proper room to be organized and comfortable, more than adequate power and backup power to run all of your machines, organized machine, supply, and medication planning, and a well thought out contingency plan for hospitals and medical emergencies. Do more planning than you think you need up front, talk with your doctors and resources about your plans and needs ahead of time, and don't hesitate to ask any of them for help to make your trip a reality. 5,000 miles driven. Over 15 newspaper articles written, four nightly news segments aired, and two radio interviews broadcast. theGSF's first official fundraiser. Over $44,000 raised.